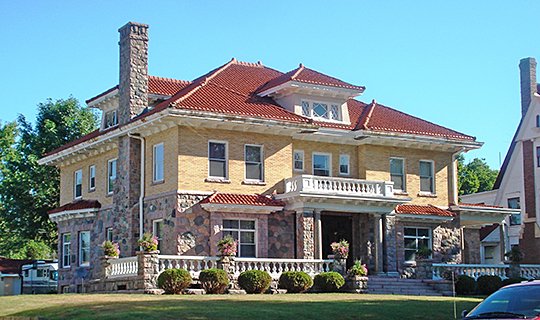 Photo: Leroy R. Willard House (Willard Mansion), ca. 1910, 609 West Main Street, Marshalltown, IA. Listed on the National Register of Historic Places in 1976. Photographed by user:Kepper66 (own work), 2011, [cc-by-3.0 (creativecommons.org/licenses/by/3.0)], via Wikimedia Commons, accessed August, 2013. The Marshall County Courthouse is located at 1 East Main Street, Marshalltown, IA 50158; phone: 641-754-1604. Named for United States Chief Justice John Marshall. The first settler in what would become Marshall County was Joseph C. Davidson who made his claim in 1847. He settled with his wife and family. Davidson was a trapper associated with a man named William Pilgrim. The area was a stomping ground for the two men, and the were through the Iowa River valley many times before settling here.